Welcome to our tour of Normandy, France. Mont Saint-Michel glows like a beacon on the edge of the sea. Photo: WikiMedia.org. Renowned for that fateful day when the Allied Troops landed on D-Day during World War II, the coast of Normandy indeed offers solemn journeys to those wanting to pay their respects but don't miss out on its cultural enrichment inland where you'll discover its art and architecture and scrumptious Camembert, fresh produce and those wild mushrooms for which this region is known for! Just a few hours from Paris, Normandy offers a world of opportunities of discovery from Omaha Beach and Mont Saint-Michele to Bayeux and Rouen. Join me on tour through some of the best places to visit in this one-time land of the Vikings and the Normans on the northern coast of France. Rising from the tidal flats in Normandy, Mont Saint-Michel appears to float in the mist on the horizon. Photo: WikiMedia.org. Rising from the tidal flats off the coast of Normandy, Mont Saint-Michel stands as a beacon on the horizon and evokes awe at first sight of this magnificent monument floating on the sea! Steeped in history dating back more than 1,200 years, this island abbey was first consecrated in 706 and dedicated to Saint Michael, who according to legend, spoke to the Bishop Aubert of Avaranches and told him to "Build here and build high," his monastery upon this craggy islet known then as Mont Tombe. Actually you can see the Archangel Saint Michael himself towering 560 feet above the England Channel from his lofty perch atop the abbey's spire! Steeped in history dating back to eighth century, Mont Saint-Michel is the culmination of 1,000 years of construction that would ultimately bring these monks closer to God and Heaven. Starting out as a pre-Romanesque church established before the end of the first millennium, each successive century brought with it expansion and grandeur that continued through the 1800s. Even today, renovation continues to ensure that Mont Saint-Michel stands for another 1,000 years! Mont Saint-Michel and its medieval village in Normandy, France. Photo: WikiMedia.org. 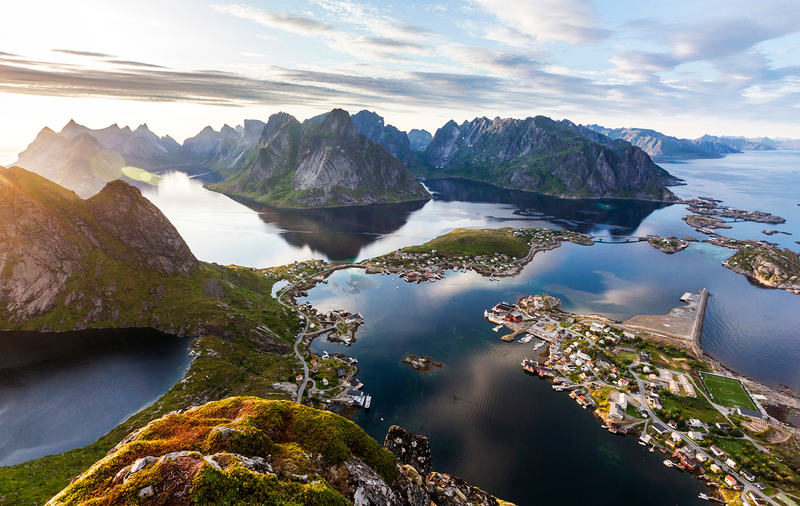 Looking back through the centuries, we arrive in the 11th where we see the Romanesque Abbey church and the first of the monastery edifices set upon pre-existing crypts at the northern side of the rocky islet. Additional monastery buildings on the western and southern side were constructed in the 12th century by Robert de Thorigny and it was the King of France, Philippe August, who funded the 13th-century Gothic additions known as the "Merveille" which included the cloisters, crypts and other two to three-story monastery buildings. Also during this time, the village at the base began to flourish. Due to the onslaught of wartime, military fortifications were erected in the 14th century to guard the mount during the Hundred Years War. During the 15th century, a new Gothic chancel replaced its Romanesque predecessor and other refinements continued through to the 18th century including living quarters on the south side of the mount. Quite a long period of development but the end result continues to astonish to this day! 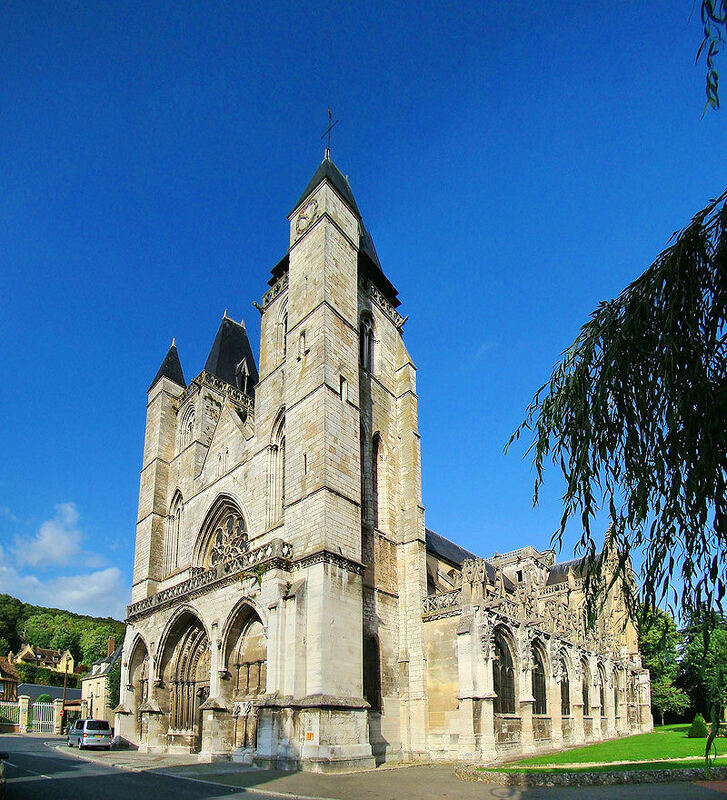 During the French Revolution, the abbey served as a prison until Victor Hugo who strongly opposed the abbey's use in this manner, led a campaign to restore the edifice to its former glory. It was declared a historic monument in 1874 and added to the UNESCO World Heritage list in 1979. 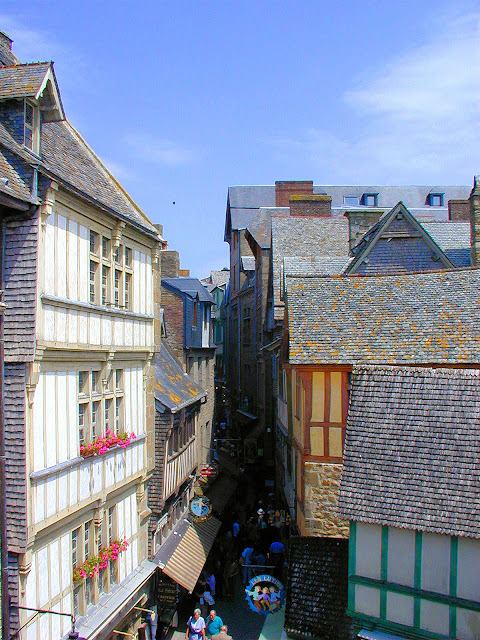 Storied half-timbered architecture lines the streets in the medieval village at the base of Mont Saint-Michel. Photo: WikiMedia.org. Tours will lead you through the imposing Église Abbatiale, the Romanesque / Gothic abbey perched atop of Mont Saint-Michel; the 13th-century Merveille, a series of rooms and passages built by King Philippe as I mentioned above, the Escalier de Dentelle or Lace Stairway; and the pre-Roman edifice Chapelle de Notre Dame sous Terre or Underground Chapel of Our Lady. Today, Mont Saint-Michel is connected to mainland France by a bridge however, the causeway closed in April 2012 and access from the mainland is by shuttle or walking only. A major project is underway to dredge the bay and build a bridge thus allowing water to once again flow freely around Mont Saint-Michel. Access will be by shuttle from the mainland when the project is completed in 2014/2015. Renowned for its one-of-a-kind and inimitable omelette, La Mère Pollard has been serving residents and visitors alike since 1888. Photo: Gauis Caecilius. Once you finally arrive at the end of the causeway, the main gate or Porte de l'Avancée will lead to the Grand-Rue, a charming narrow street flanked by 16th and 17th-century buildings and be sure to stop for a quick bite at La Mère Pollard's whose renowned namesake omelette has been enjoyed by residents and visitors since 1888. Once you're finished eating, you can follow this route to the Abbey as do most tourists or perhaps choose one of these less traveled routes once you're on the island: head to the stairs at the right up to the ramparts, or turn left to Porte Eschaugette. All of these routes culminate at the crowning Abbey. Colleville Cemetery on Omaha Beach Normandy. Photo was taken from Plot E looking toward Plot C and the circular chapel at the upper left. Photo: WikiMedia.org. 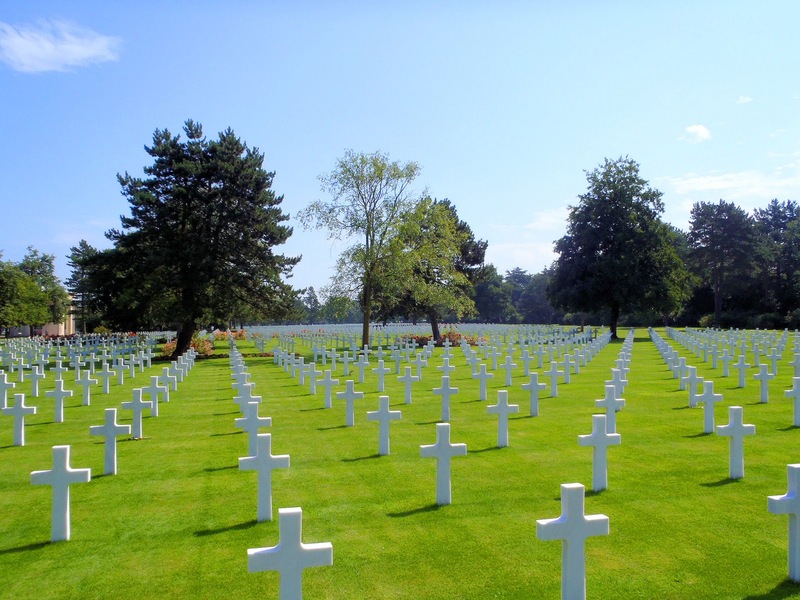 Located on a hill overlooking Omaha Beach, The Normandy American Cemetery is the resting spot for more 9,387 members of the military, of which 2,000 were Americans, who gave the ultimate sacrifice for freedom. Here you can retrace the steps of the Allied forces as they landed on the northern coast of France on that fateful day back in June 6, 1944 also known as D-Day. Covering 172.5 acres, the Normandy American Cemetery opened June 8, 1944, and was the first American cemetery in Europe during the war—a most somber experience for all who visit this tranquil setting honoring our fallen heroes and some of the bravest military in the world. Among the many monuments erected are the "Walls of the Missing" etched with 1,557 names, some with Rosettes marking those who were later identified; a circular chapel whose ceiling mosaic depicts Lady America blessing her sons as they brave the war; the 22-foot-bronze statue entitled "Spirit of American Youth Rising from the Waves," sculpted by Donald De Lue of Leonardo, New Jersey, and encircled at its base are the words "Mine Eyes Have Seen The Glory of the Coming of the Lord;" finally, two granite statues, one representing France and the other, the United States of America. For more information and in-depth videos, check out American Battle Monuments Commission. 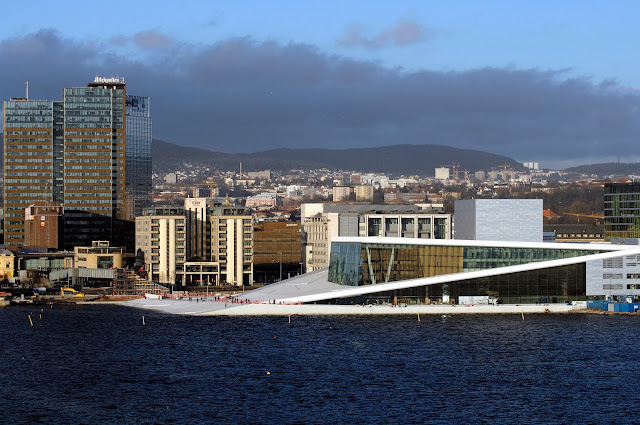 Here's a moving narrated video tour from VikingRiverCruises. Open every day except Christmas Day and New Years Day. April 15—Sept. 15 from 9 a.m. to 6 p.m.
Sept. 16—April 14 from 9 a.m. to 5 p.m.
A small section of the 230-foot-long Bayeux Tapestry. Photo: WikiMedia.org. Moving east, we arrive at the home of the Bayeux Tapestry whose name derives from its hometown. Did you know that the tapestry is not a tapestry at all? Actually it's an embroidered cloth whereas a tapestry is a textile woven on a loom. This exquisite work of art, 230 feet long, depicts in meticulous detail, 50 scenes of the events leading up to the Norman conquest of England in 1066. Before its permanent home at the Musée de la Tapisserie de Bayeux, it was displayed at the Bayeux Cathedral during special exhibitions. Read more about the history of the Bayeux Tapestry in "Storytelling in Fabric" by DaydreamTourist.com. After your visit to the tapestry, seek out its original home—the Bayeux Cathedral which was consecrated nearly 1,000 years ago in 1077. Or perhaps stroll along its storied lanes flanked by half-timbered architecture housing quaint shops, homes and cafés. 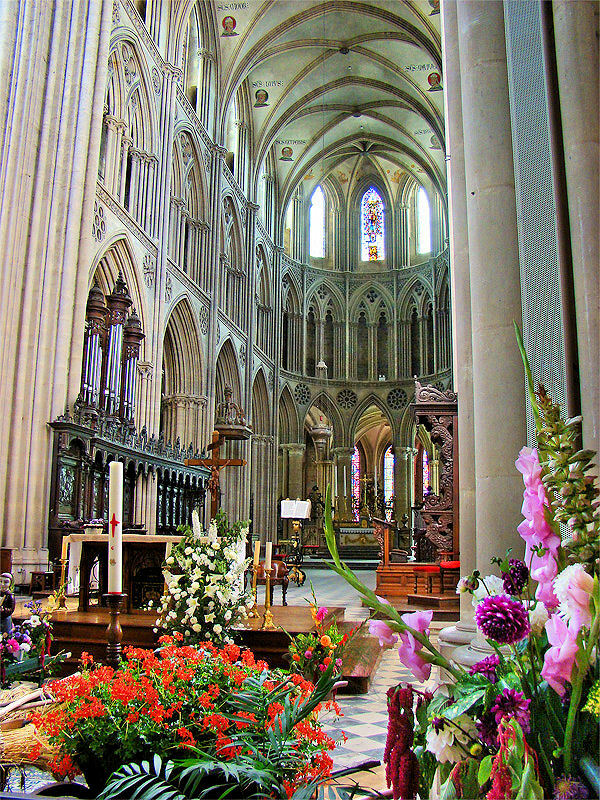 Original home to the Bayeux Tapestry, the Bayeux Cathedral is ablaze with color. Photo: WikiMedia.org. Bayeux historic centre office of tourism and Bayeux cathedral in the distance. Photo: WikiMedia.org. Monet's Garden in Giverny, France. Photo: WikiMedia.org. Adored by artists the world over, Normandy is where the Impressionistic movement was born in the 19th century. Its progeny—a company of artists who embraced this new art form and painted timeless masterpieces that we continue to cherish today! Among these pioneering Impressionists—Degas, Renoir and master Monet! Once you're here, you'll understand from whence their inspiration came: the quality of light as it falls along the River Seine flowing through gardens teeming with vibrant blooms and verdant tapestries, especially in Giverny, sets the imagination ablaze. And this light not only draws artists but architects and photographers as well—the visual splendor of Normandy awaits its artists' canvases. In just about every city throughout Normandy, you'll have the opportunity to visit the museums and see the famous works knowing that you appreciate fully the source of their vivid imaginations! Chief among the most popular places to visit are Honfleur, Étretat's white cliffs, Giverny and Monet's Garden, and the centerpiece of Rouen, its cathedral which was one of Monet's favorite subjects to paint. More on Monet below. One of Monet's favorite subjects, the Rouen Cathedral. Photo: WikiMedia.org. 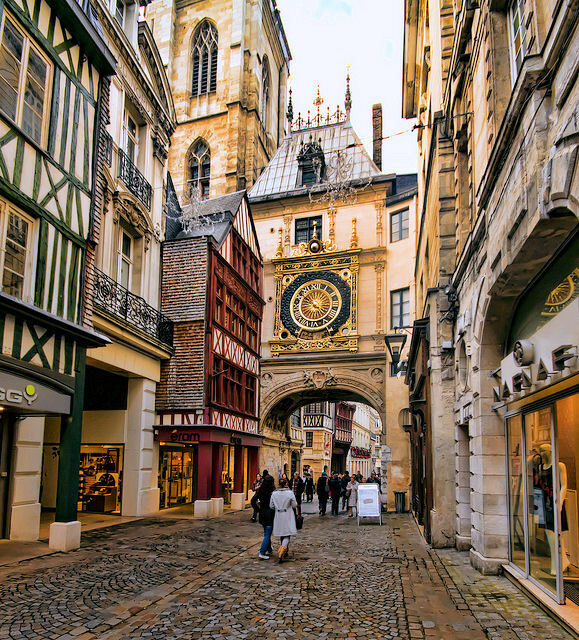 Art, history and architecture abound in the culturally-rich city that is Rouen. Dominating the city along the River Seine is its magnificent Gothic cathedral, immortalized by Monet in his 28-piece series of works that include various perspectives of the cathedral seen at different times of the day as well as different seasons of the year—Notre Dame de Rouen. And fans of this architectural style will revel in the Monastery of Saint-Ouen, equally as stunning, and the Church of Saint-Maclou, myself included! Alas, a solemn time in our history put Rouen on the map as well—Joan of Arc was tried, convicted and burned at the stake at the Place du Vieux-Marché. The Church of Joan of Arc opened in 1979 in her honor. Gros Horloge or Big Clock dates back to the 14th century. Photo: Rob Slater. 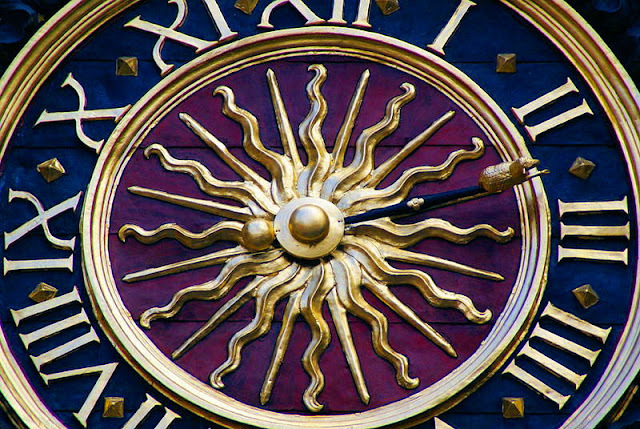 The Gros Horloge or the Big Clock charms and chimes along the Rue du Gros Horloge, a 420-meter street passing under this astronomical clock and Renaissance arch it rests upon. The inner workings date to the 14th century however, the faces of clock on both sides of the tower were added in 1409 and subsequently, the elaborate Renaissance embellishments in the 16th century. If you look beneath the arch, there's a carving of a shepherd and his flock symbolizing John the Baptist who can be seen on the city's coat of arms as well. Close-up view of the Gros Horloge or Big Clock. Note the vibrant colors and the lamb at the end of the hour hand. Photo: WikiMedia.org. Showing only the hour of the day with an hour hand capped off with a lamb, the Big Clock also displays moon phases and days of the week characterized by mythological deities: Diana, goddess of the hunt and moon for Monday; Mars, the god of war on Tuesday; Mercury, the messenger god on Wednesday; Jupiter, need I explain on Thursday; Venus, the goddess of Love, on Friday; Saturn, god of agriculture and wealth on Saturday; and finally Apollo, god of music on Sunday. And speaking of music, if you listen carefully, you'll hear the peal of the bells in the adjacent belfry as they chime away the hours in synch with the Gros Horloge. 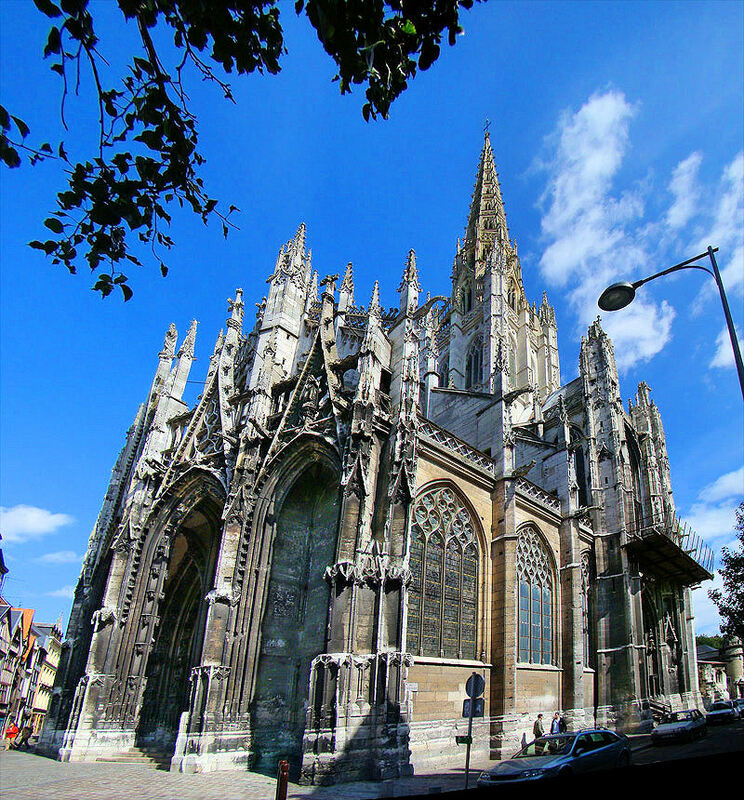 Church of Saint-Maclou in Rouen, France. Photo: WikiMedia.org. Located next door inside the Belfry on the Rue de Gros Horloge, there's a small museum where you can see the workshop of the clockmaker, clockworks and even the bells. Plus, you'll discover some of the oldest time pieces and bells in all of France that date back to the 13th century. In the surrounding rooms, retrace the history of Rouen via multiple exhibits. Best of all, climb up to the top of the tower where you'll be rewarded with spectacular panoramic views of Rouen and the Cathédral Notre Dame towering on the horizon. One of Monet's many Rouen Cathedral paintings in his series of 28 portraits that captured Notre Dame in various light and times of the year. Photo: WikiMedia.org. Since the 4th century, a church has occupied these hallowed grounds and since, the Cathedral Notre Dame de Rouen has been plagued by one natural or war disaster after another and has met many an untimely death throughout history. It survives today as a montage of the eras in which it lived and as testament to the perseverance of the people of Rouen. Blending a variety of architectural styles from the early Gothic to the Renaissance due to the aforementioned periods of destruction, the cathedral we see today was mostly built between the 13th and 15th centuries. 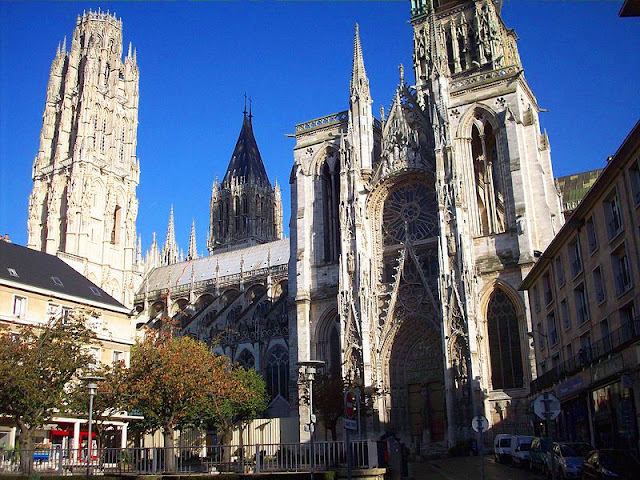 From its three distinct towers to the parade of sculpted saints lining the interior side aisles and from the crypts below to the soaring arches extending four stories toward heaven, the Rouen cathedral is definitely worth a stop on any Norman itinerary. Other highlights include the stunning stained-glass windows in the ambulatory that span from the Gothic to the Renaissance, the tomb of Richard the Lionheart and the Palais de I'Archevêché or Archbishop's Palace behind the cathedral where Joan of Arc was tried in 1431. Completed in 1870, the Musée des Beaux Arts features an impressive collection of paintings spanning the 15th to 20th centuries by Rubens, Caravaggio, Renoir, of course Monet—among many others. 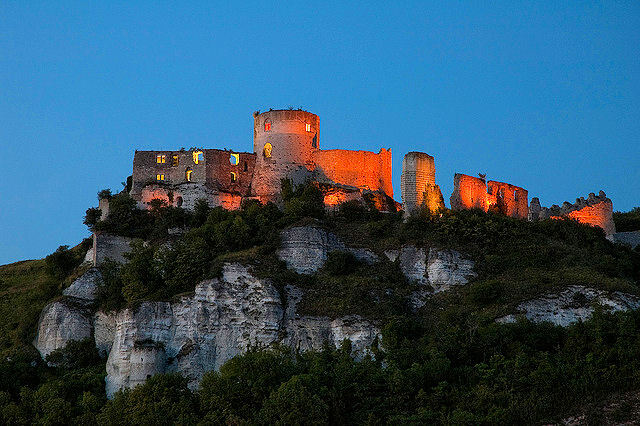 Chateau-Gaillard looms over Les Andelys and was built by Richard the Lionheart during the same time as the city's cathedral. Photo: Svimes. Located about 45 minutes southeast of Rouen is the village of Les Andelys with its magnificent 12th-century cathedral Notre Dame or Our Lady's Church in the city centre; and dominated by the imposing fortress that is Chateau-Gaillard (fortified castle) built at the same time as the cathedral by Richard the Lionheart, Duke of Normandy. Strategically perched to minimize attacks, this mighty fortress has been standing sentinel for more than 800 years! Both of these are must-see sites in your grand tour of Normandy. Notre Dame or Our Lady's Church in Les Andelys. Photo: WikiMedia.org. View of Les Andelys as seen from the Chateau-Gaillard's strategic perch upon the nearby mount. Photo: Allie Caulfield. 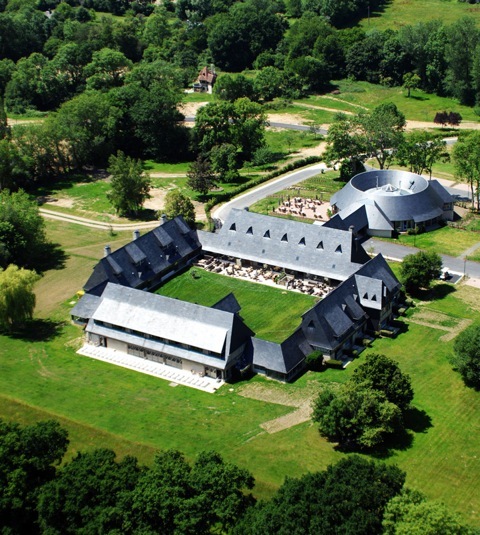 Aerial shot of Les Manoirs de Tourgéville shows the main manor house and one of five circular manors spread throughout the property's park lands. Photo: Courtesy of Les Manoirs de Tourgéville. In the heart of the history and visual romance of Normandy, and what inspired me to write this feature about Normandy, was my discovery of a charming retreat set amidst idyllic lands in the Norman countryside—Les Manoirs de Tourgéville. 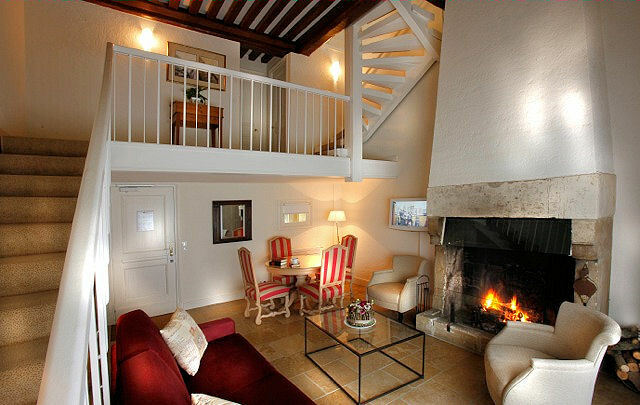 Conveniently located to all of the places I described above, Les Manoirs retains the region's storied architecture with half-timbered facades and themed interiors inspired by the Norman region. 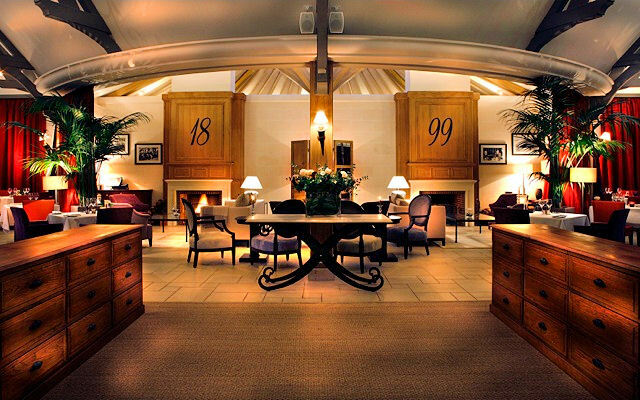 Welcome to "1899," Les Manoirs' signature restaurant. Photo: Courtesy of Les Manoirs de Tourgéville. The main manor is a four-sided building that surrounds a courtyard and is attached to one of five circular manor houses spread throughout the property. But this particular manor houses the hotel's signature restaurant "1899," named for the year in which the founder of the Groupe Floirat was born. Once inside, diners are rewarded with elegant settings and sweeping panoramic views of sylvan countryside, not to mention a menu that serves up some of the region's finest cuisine. Among its myriad amenities to enjoy after a long day of touring the Norman countryside are the swimming pool and sauna, fitness gym and spa, golf course, and plenty of park land for hiking and biking. Also, there's a cinema or projection room that shows premiers from time to time. No surprise really though with the nearby annual Film Festival in Deauville. A warm and inviting ambiance fills this cozy triplex, one of six styles of accommodations. Photo: Courtesy of Les Manoirs de Tourgéville. This deluxe property features six levels of accommodations ranging from a standard manor room starting at 150€ in low season and 235€ in high, to the supreme suite priced at 360€ in low and 580€ in high. Special offers and packages are available too depending on the time of year—definitely worth checking out. Visit Les Manoirs de Tourgéville for more information. That's a wrap on our tour through Normandy, France. Have you been to any of these places? 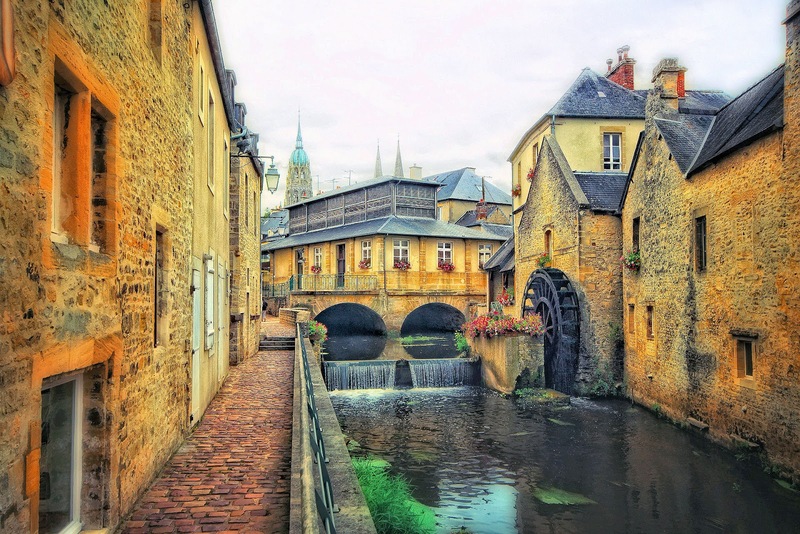 What are among your favorite places or things to see and do in Normandy? Please share your experiences below. I loved every minute I was in Normandy and am saddened every time someone tells me they did the D-Day beaches or Mont St Michel as a day trip from Paris. We spent our time in the little seaside village of Cabourg or over by the "mont". I would love to rent a farmhouse in the region and spend weeks exploring all of Normandy! Thanks for this. It allowed me to relive my visit to Normandy. Hi there Debbie and thanks so much for stopping by! Ww...what a time you had in Normandy...and that village of Cabourg sounds positively enchanting! I will definitely have to look into that place for sure after your glowing recommendation!!! Thanks for sharing your experiences my friend!! Ohmigosh, Normandy is such an important destination for Canadians, Jeff. 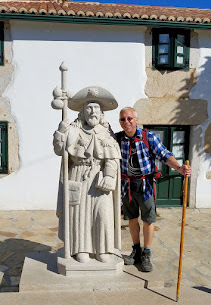 The photos definitely make it look worth staying a week or two to soak up the history and the sea air. Hi there Lesley and thx so much for stopping by! I couldn't agree with more...definitely a week or two to see all of this and so many more stops along the way that I didn't have room to write about. What an incredible tour of Normandy, it makes me want to revisit France all the more, especially St Michel! Hi there Charu and thx so much for stopping by and for your kind words! It is an incredible tour and so much more to see as well. Great post! Normandy is on my short list...maybe this summer? I'm taking notes...thanks Jeff! Hi there Corinne and thank you so much for stopping by and for your kind words. You'll have to keep me posted regarding your upcoming trip this summer if you decide to go. We're heading to Villers Bretonneux for the Anzac Day service this year so it was fortuitous timing to read your great post on what to see in the area. Can't wait to see all the places you mention! Hi there Jenny! How wonderful you will be there during Anzac Day...Omaha Beach is a must for you then. Thank you for stopping by and sharing your thoughts and be sure to stop back to tell me all about your trip. I am hoping to make it there during my stay in France come September but there is so much I want to do it can get overwhelming which is why I am having the giveaway where readers help me focus my planning and hopefully I get to hear of some great hidden gems. All these stops look and sound like it is worth my time! Definitely an enchanting region. Hi there Murissa and thx so much for your comment! Couldn't agree with you more about defining priorities so you don't run yourself into exhaustion. Just think of it this way...whatever you miss this time around will be there upon your return. This way, you'll have a reason to come back again and again. Really impressive photos and a great post. I like the fact that you provided so many interesting and useful information. I just got back from a trip to Paris and I have to say that, if I had more time there, I would have visited Mont Saint-Michel. But I'll keep it in mind for a next trip - maybe I'll include some of your recommendations from this post, Jeff. Hi there Lori and thx so much for stopping by! Thank you too, for your kind words...and hope you do make it back to take advantage of some of the places I've mentioned above. Well worth it, I must say! Thx again. This area of France has such meaning for me, as my Papineau ancestors lived in this area. It is my dream to visit Mont St. Michel one day. Great article! Hi there Marcia and thank you so much for stopping by today. You are the 2nd person I have met today that has Papineau ancestors living in the area. What are the chances? I think it's extraordinary! Thank you so much for stopping by. Just by looking at these photos you've sold me on a visit to this part of France. I've seen a lot of France but not this area. Wow. Hi there Leigh and thank you so much for your kind words! You'll have to let me know when you visit and send me pics too! Thank you for stopping by! Well, I'd go there if I really had to... ;P Looks great! Awesome pics! Hi there Anthony and thx so much for stopping by and for your kind compliments! When I visited Mount Saint Michel's Abbey I was definitely stroken by its grandeur; perched there on that hill, by that scenic landscape with flocks of sheep embellishing the surroundings and by that out of this world panorama.There were also those moving sands that send a bit shivers down my spine. And I have to say that your post is so well-done that I am looking forward to visiting the other sightseeing places which I heard about a lot.Keep on travelling!!! Hi there Diana and thank you so much for stopping by and for your kind compliments too! Mont Saint-Michel certainly captivates once you see this mighty edifice floating on the horizon, it's magical!! Please stop back again! 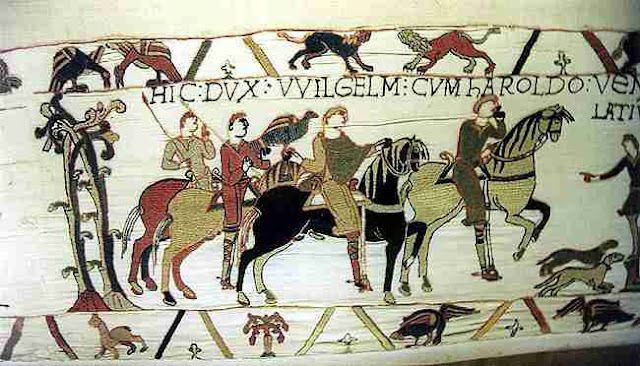 Jeff, thanks for linking to my Bayeux Tapestry article! Normandy really is a fantastic region. You've done a great job highlighting all the rich historical and cultural sights there! Hi Christina! You are more than welcome my friend. Your comprehensive overview of the tapestry is brilliant so it only made sense to add a link for me readers! Thank you for the brilliant piece, your kind words and for stopping by!! 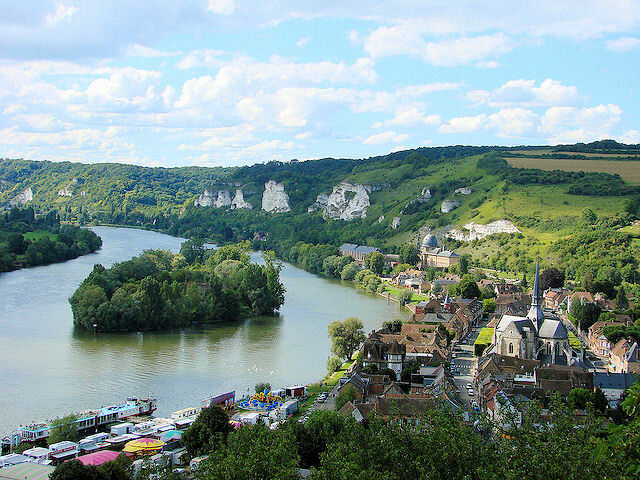 Normandy is my favorite region of France thanks to the history, beauty, people, and calvados. Thanks for bringing back great memories. HI there Ted and thanks so much for stopping by!! Glad you enjoyed the memories and most of all, the calvados too!! I bet they are delicious! !